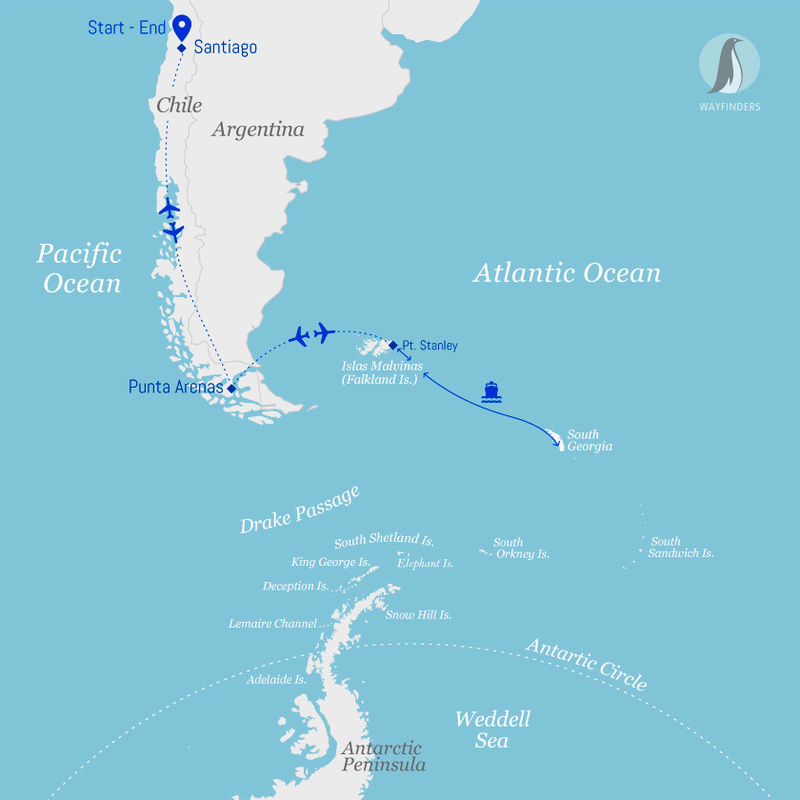 It will be autumn in the Falklands and South Georgia with timing that is close to when Shackleton and his five companions in the James Caird arrived in South Georgia from their historic sea crossing from Elephant Island. When we visit South Georgia, we will visit many of the places Shackleton travelled in his epic rescue adventure. Meanwhile, everywhere we go, penguin and albatross chicks will be preparing to set out to make their own way in the world. Penguin chicks will be moulted and at their peak of curiosity. It’s an exciting time to be visiting these places. If you travel to the Falkland Islands today with the rest of the group, you will be transferred from the airport to Polar Pioneer with a tour of Stanley included. If you wish to see more of the Falkland Islands you may book your flight to arrive one week early to explore this very British outpost. If you do so you will make your own way to the pier to board the ship. Please Note: There is only one flight a week to Stanley, each Saturday. It is subject to availability and may involve an additional surcharge. If you have chosen to fly today, make your own way to the airport to embark your flight in either Santiago or Punta Arenas. This is a regularly scheduled domestic flight so you will check-in and board as you would any domestic flight. You will arrive in Stanley in the early afternoon. Please collect your own bags before exiting the terminal. You will be met by our local guide at the Mount Pleasant airport. Your baggage will be loaded onto a truck and you will board a bus for the one-hour ride to Stanley. already be in your cabins. After a little time to settle in and explore the ship, we will get together for introductions and our required safety briefing. But it’ll be everyone on deck as we depart Stanley harbour and begin our adventure. As we round the Falkland Islands on our way to our second stop, we will settle into shipboard life and enjoy our first meal on board. Steeple Jason all day – contingency landing: Saunders, Westpoint or Carcass Islands. Steeple Jason Island is a rarely visited jewel and the most remote of all West Falklands islands. It rises sharply from the sea and is one of the most dramatic islands on the archipelago. Its remoteness and rugged coast make it difficult to visit but it is home to the world’s largest black-browed albatross colony and the area has significant importance to conservationists. Its rare beauty and its huge albatross colony make it an important goal for us. We will do our best to visit Steeple Jason, but if conditions are too harsh, we have other exciting islands to choose from. Second largest offshore island in the archipelago and is a working sheep farm. Saunders is rich in wildlife and history, the island boasts four species of penguins and a spectacular black-browed albatross colony on its northern cliffs. The combination of wildlife and natural, scenic beauty afford some of the best photography opportunities in the World. Named after the HMS Carcass which surveyed the island in 1766, Carcass island is cat and rat free. That makes it a haven for small birds including endemic Cobb’s Wren, dark ground tyrants, tussac birds, and striated caracaras abound. It also boasts 3 species of penguins and a black-browed albatross colony with spectacular access to be within meters of their nests. Home to numerous species of plants, birds and marine mammals, spectacular cliffs are a feature along the coastline. Rich wildlife, a picturesque settlement and small harbour often teeming with Commerson’s dolphins make this island well worth a visit. Sailing towards South Georgia gives us time to catch our breath and slow to the rhythm of the sea. Between the Falkland Islands and South Georgia we will prepare you for your expedition with a schedule of informative talks on wildlife and history. There will be plenty of time to simply relax and be entranced by the many seabirds we’ll encounter on our way. You may decide to join the avid whale watchers hoping to get a glimpse of leviathan, or simply contemplate the vastness of the sea. Instead you may prefer to relax and read a favourite book or socialise with shipmates. The mood on board is definitely casual. A favourite pastime is to stand on the stern deck to watch and photograph albatrosses, giant petrels and other seabirds following in our wake. It’s mesmerizing to watch as they skilfully ride the wind back and forth behind the ship. Our chefs will prepare delicious meals that, accompanied by good conversation, will become a focal point of shipboard life. If time and weather conditions permit, we may pass close to Shag Rocks, a fascinating group of rocky islets that attract seabirds and sea mammals in their thousands. Feeling transformed, we approach South Georgia, receptive and open. Before our first landing you will be given guidelines for our behaviour around the wildlife and talk about the implications of the Antarctic Treaty. Importantly, we will take care of our biosecurity procedures to ensure that South Georgia remains protected from introduced organisms and as pristine as possible. South Georgia is one of the most beautiful places in the world. The island is just a speck in the vastness of the South Atlantic Ocean, one of the most remote parts of our planet. A 3,000-metre mountain range forms the spine of this long, narrow island. Between the mountains, shattered glaciers carve their way through tussock grass to the deeply indented coastline. Geographically speaking, the island lies in the subantarctic, as do Macquarie Island and Heard Island, but it lies wholly within the Antarctic Convergence so it has a climate more in keeping with Antarctica. Despite being such a small outpost in the vastness of the south Atlantic, the sea around South Georgia is one of the most productive areas on Earth. The abundant marine life supports millions of seals, whales, penguins and other seabirds. Politically speaking South Georgia also lies north of 60° South latitude so is not part of the Antarctic treaty. It is a wholly British possession, claimed and named for King George III on 16 January 1775 by Captain James Cook. Often our first landfall when coming from Stanley, at this time of year the fur seal pups will be getting ready to strike out on their own so the beaches will give us enough room to visit without worrying about fur seal numbers. Elsehul is best experienced from the zodiacs. It will be a magnificent introduction to the abundance and diversity on South Georgia. Several species of albatross nest on the slopes above the bay. Macaroni penguins climb insanely steep paths to reach their precarious colonies. 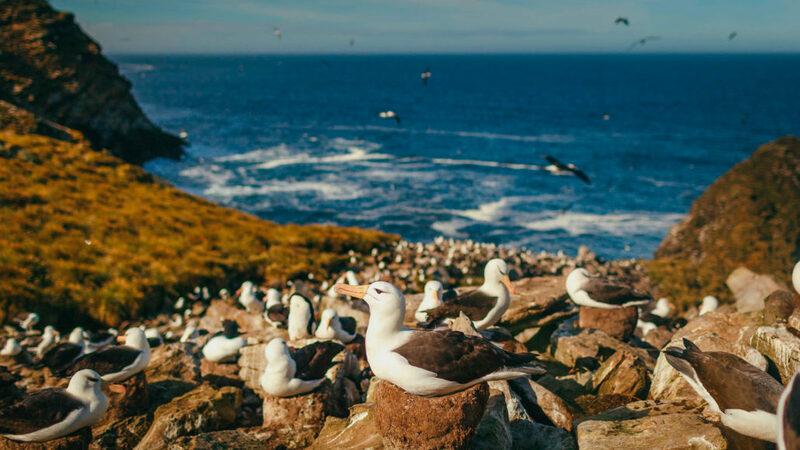 Prion Island is one of the few places in the world where it is possible to visit wandering albatross sitting on their nest—and if we are lucky, witness the magnificent courting rituals of the younger birds forming life-long pairings. We must take great care with the albatross on the island and remain on a boardwalk. Despite these restrictions, the photographic opportunities are excellent. Prion Island is also one of the best places to find the unique endemic, the South Georgia Pipit. On to shore from Prion Island is Salisbury Plain with one of the largest king penguin colonies on South Georgia. With about 100,000 pairs, the shore and beach are simply covered with penguins. Along the beach you will also find fur seals and elephant seals mixed in. There is a tremendous scope for walking and exploring on your own at this site so enjoy your time amongst the kings. Originally a Norwegian sealing and whaling station, it was finally abandoned in 1965. Here we must be careful to avoid stepping on sleeping elephant seals as we skirt the ruins of Factory buildings peering into the past, trying to imagine what it was like when whale processing was in full swing. Abandoned ships lie sunken alongside old wharves, while pitted concrete walls remind us of the more recent Falkland’s War, which started here. Sir Ernest Shackleton died from a heart attack during his final expedition on board the Quest on 6 May 1922. His body was laid to rest at Grytviken and we hope to make a pilgrimage to visit the cross his men erected in his memory looking out across beautiful Cumberland Bay. The sandy black beach is a resting place for hundreds of elephant seals that haul out on the shore to moult. Behind the beach, the sight and sound of tens upon tens of thousands of king penguins at different stages of their breeding cycle will be overwhelming. The glacial river that runs into the sea here will be alive with penguin chicks and elephant seal pups testing their aquatic skills. If we lift our gaze from the wildlife for a moment, we will glimpse the snow-capped peaks of some of the world’s most spectacular mountains. A deep bay along the coast, Fortuna often gives shelter when some other bays do not. Surrounded by high mountains with glaciers dropping out of the high country to terminate in the open valley. Fortuna Bay is also home to a small king penguin colony that will draw our interest. It is also the where Shackleton, Crean and Worsley came down off the treacherous glaciers of the interior on their way to Stromness whaling station. If conditions allow we can walk in the footsteps of Shackleton and follow their track over the last mountain pass. It’s a moderately difficult 6 km walk over a 300 meter pass so not everyone will be able or willing, but it’s well worth the experience. The Polar Pioneer can meet us as we stagger into Stromness Bay just as Shackleton did 100 years ago. Other stunning wildlife destinations we may visit include: Right Whale Bay, Godthul, Royal Harbour, Moltke Harbour, Gold Harbour, Cooper Bay, Drygalski Fjord, Larsen Harbour, King Haakon Bay. We begin cruising back toward the Falkland Islands and our departure. Usually we are travelling into the prevailing weather on this stage of the voyage so it is difficult to predict what conditions we may experience. The lecture program will continue, and the parade of seabirds around the ship will continue for these days. Almost as important, it is a time to review and reflect on the experiences of the voyage—and sorting through all those photos that want captions. On our last day of the voyage, we will cruise into Stanley Harbour first thing in the morning. You have the choice of extending your stay in this very British outpost or continuing directly on the afternoon flight to Punta Arenas and on to Santiago. Our local guide will take care of everyone heading to Mount Pleasant airport. Please note: If you wish to stay on in Stanley (or visit other outer islands), flights operate once per week on Saturdays and are subject to availability and may involve an additional surcharge. All entry fees to landing sites. Transfer from ship to Stanley airport at Mount Pleasant. All items of a personal nature including but not limited to: alcoholic beverages and soft drinks, laundry services, personal clothing, medical expenses, gratuities, and email or phone charges.